Chatting, flirting, playing games; Smeet even allows its users to take care of a virtual pet or garden. 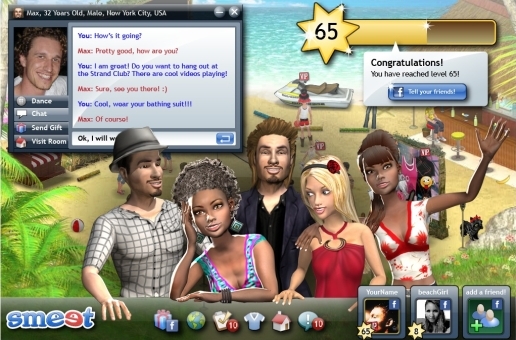 Founded in 2006, the Berlin company offers a virtual 3D world with interaction via avatars as a key element, connecting live entertainment and communication features. VentureVillage had the opportunity to ask Sebastian Funke, co-founder and CEO of Smeet, about the company’s development, financing and internationalization. Enjoy! Sebastian, please give us a short introduction of yourself. I am the co-founder and CEO of Smeet, Europe’s largest 3D interactive social game. As one of the founders, I am involved in many aspects of the company overall, including the development of our company strategy. Additionally, one of my main tasks is coordinating the strategic and operational marketing, PR and business development, including all partnerships worldwide. Since I became CEO in the beginning of 2009, the team has grown to over 110 employees, and Smeet is represented in more than 15 countries and over ten million users are playing the social chat game worldwide. What exactly does Smeet do? Smeet offers the most vibrant and interactive place to playfully meet people on the internet. Users play with their friends on Facebook by using the site’s posting and requesting functionality to invite new users and bring existing players back to Smeet gaming worlds – on and off Facebook. In this way, players meet new people and connect with them over time, creating new social relationships and enabling long-term retention, above-average lifetime usage and monetization. In an interview with Gründerszene in 2007, your company clearly dissociated itself from the idea of being a mere community and called itself an “enabler”. Now, you’re branded as a “3D interactive social game”. How has Smeet developed over the years? Smeet started as a platform for multi-user telephony, but since the beginning of 2009, we have been shifting our focus to becoming a virtual world in which users can meet people from all over the world. Although becoming a virtual world has been the right strategic step, we have seen that users need more activities to keep them busy on the platform. This gave us the idea of introducing gaming elements such as points, levels, badges and achievements. Currently people come for two reasons. Firstly, to build up their houses, avatars and social statuses through collecting points, levelling up, and harvesting and investing energy in different worlds. Secondly, to meet real people live online when they navigate through the different worlds and games with their avatars. With the integration of the social gaming elements on Smeet, we saw our company KPIs jump significantly. Now people invite many more friends, spend more money, stay much longer on our platform, and come back more often. Of how much help has Facebook been during that time? Where would you be without Facebook today and do you see other social networks such as Google+ as a gift or as a curse? Facebook is one of our acquisition channels in addition to SEM, SEO, display marketing and TV marketing. Facebook can be very powerful with regards to virality and retention. Even without going directly to Facebook, our users have the opportunity to ask their friends for help in completing game tasks or to challenge them through the Facebook posting and requesting functionalities. However, Smeet is not dependent on Facebook, because Smeet is used ON and OFF of Facebook as an independent platform. The Smeet application is just another entry channel for our users, just like our own website or applications on partner websites. Google+ might be an option in the future. We are keeping a close eye on its development, but so far we are not sure if this network really has the potential of providing a relevant target group for us. Almost 300,000 facebook fans present a great endorsement from the users, but also a big task. What steps are you taking in order to hold the community despite tough competition? We are invested in delivering engaging content to our users through the platform and our Facebook fan page, and will continue to provide great customer care and continuous innovation on the platform itself. From the beginning, Smeet has been heavily invested in our community management on the platform and, more recently, on Facebook as well. We see customer care and community management as a crucial part of our strategy. Smeet is free. How do you earn money? Smeet uses a “freemium” model. You sign up for free and pay for special items, special rights and/or content. With a choice of thousands of items, our users customize their avatars and virtual homes. They can also send items as gifts as a way to establish new relationships or just let their friends know they are thinking about them. Last but not least, users can also buy “boosters” or “energy” to level up in the games. Smeet is the only product that monetizes all three of these aspects (gifting, self-display, gaming) at the same time. This gives us a competitive advantage since Smeet makes five to seven times more revenue per active users than a “typical” social game on Facebook. Revenue from the users on the one hand and financing through investors on the other: How did the collaboration with HPV come into being and how is it characterized? Since the very beginning HPV has been the lead investor in our company and even in difficult times HPV, as well as Partech who joined a short time later, have been very supportive of the company. They believe in our vision, our execution skills, and our ability to innovate continuously. However, investor funds are not supposed to carry a company throughout its lifetime, so at some point a company like ours has to be profitable, which means that we have to find the right business model. In our case, we charge users for certain services in order to have a good return to the investors who have supported us in getting the company up and running. Let’s talk about internationalization. How did you advance and what problems have you faced? Smeet is available in nine languages in more than 15 countries. All European countries are handled out of the headquarter in Berlin by native speakers. We also have an office in New York in order to be closer to the US market and its users. This makes it easier to adapt Smeet to the needs of the US users in order to be able to penetrate this market. Where do you see Smeet in a year from now? Smeet will be the leading platform for live online social experiences and interaction worldwide. With more advanced gameplay and more sophisticated social features, we aim to attract over 20 million users and deliver a fun, innovative way to playfully meet people. Thanks for the interview, Sebastian.